Tags: Banarsi, Long Length, Maroon, Maxi, Party. 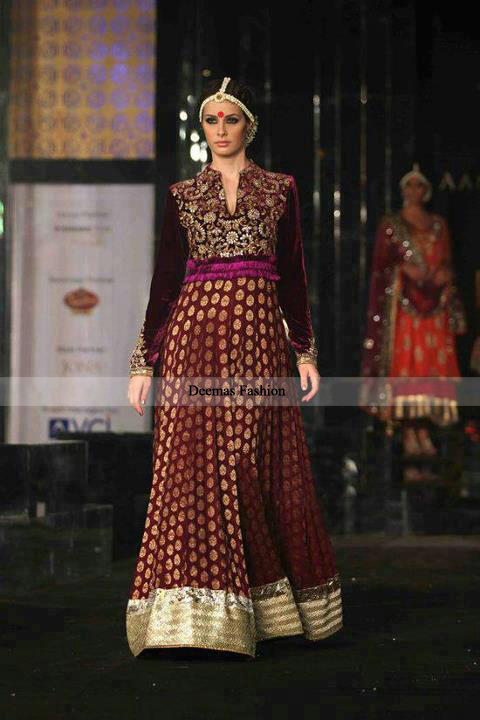 Maroon pure banarsi chiffon frock having velvet bodice which is adorned with embellishment. Golden lappa (shiny fabric) has been used at bottom. fully lined anarkali. Maroon pure raw silk churidar pajama. Maroon pure chiffon dupatta finished with banarsi border. Embellishment work includes dull golden kora, dabka, stones, beads and sequins etc.